In just a few weeks time, Ronda Rousey is set to defend her Raw Women's Championship against Charlotte Flair and Becky Lynch in what many fans expect to be the night's main event. In the 12 months since she made her in-ring debut, Rousey has had one of the greatest debut years in WWE history, establishing herself as one of the best female wrestlers in the company, and proving any doubters she had before she made debut 100% wrong. It remains to be seen whether or not Rousey will be sticking around after WrestleMania, but if she doesn't, she has left fans with a fine body of work to look back on. With that in mind, let's take a look back at all of Rousey's PPV appearances over the last 12 months and rank them from worst to best. 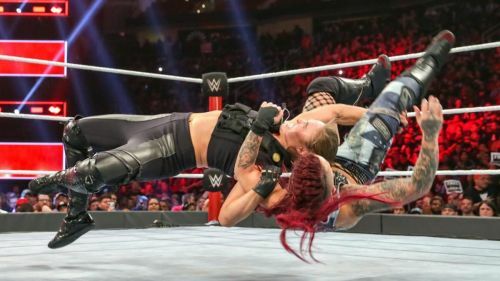 It seems slightly unfair to even list Ronda Rousey's most recent PPV outing as an official match, such was the ease with which she picked apart her opponent. The Riott Squad have spent the best part of the last six months being Rousey's personal punchbag, and there was never a greater example of this than when she forced Ruby Riott to tap-out in less than 90 seconds at the Elimination Chamber PPV. In fairness, this was more of an angle than a match, with the post-match staredown with Charlotte Flair and the subsequent arrival of Becky Lynch being the main focus here. Ronda Rousey's big title-winning moment came late on in one of the company's longest shows of 2018, and despite the whole thing being a glorified squash, most fans were thankful, given how long they had been sitting down to watch the show. Alexa Bliss had played her heelish role to perfection in the build-up to this match, and Rousey instantly set about making her pay when their big match rolled around. The whole thing lasted four minutes, and Bliss barely managed to get a punch in before Rousey made her tap-out to her patented arm-bar.